Black is a marvelous color that’s every bit as neutral as beige and white. It matches everything and can work with almost any décor. It’s growing in demand as more consumers come to appreciate the versatile shade. Easy to clean and a sharp accent in any home, it’s a great choice for doorway thresholds. Black marble is a top choice for designers and architects alike because it brings out the wood tone in trim, brings out nearby colors, and gives an exotic look to most spaces. It’s important to work with the right supplier when you’re ready to stock up on this building material. Our thresholds are also available in single or double Hollywood bevels to accommodate those special projects where you need to soften the long edges. Whether you want sleek black granite, beautiful travertine, white thazoz or Nuevo carrara white marble, we have the basic sizes you need in stock at our Miami distribution center. We take the time to keep a healthy inventory in place so that we can fill your orders quickly and help you avoid unnecessary delays. Other wholesale suppliers have a limited involvement in the supply process. They order their products from a manufacturer or even another wholesale, so they can only bring in a limited amount of stock at any given time. We’re more than just wholesale suppliers. We own the quarries and manufacture our own stones. We’re able to closely match colors and styles while providing you with the customized sizes that you need. Are you hoping for longer thresholds that will suit larger projects? Do you need to order wider thresholds to create the right look in a room? Perhaps you’re hoping for a greater thickness to use in a special project. Regardless of your reasons, we can custom order in the special sizes that you require. It does take several weeks to fill the order, but you’ll receive the same high-quality stones that you expect to receive from our distribution center. We want to provide our customers with top-quality stones at low wholesale pricing, but we believe that there’s a right way and a wrong way to keep prices low. Some companies cut corners and offer low pricing by allowing lower quality merchandise to slip through or customer service to drop. We never cut corners when it comes to the quality of your merchandise or customer service. Instead, we choose to cut costs by taking better control of our manufacturing and shipping processes. It all starts at the quarries where we’ve instituted more efficient surveying and retrieval methods. Our highly trained manufacturers work to minimize waste where possible to help us cut costs further. Merchandise is shipped from overseas in large containers that are more affordable. The shipping process takes a little longer, but we have the most common sizes in stock at our warehouse to ensure that your needs will always be met. We also have a limited inventory that facilitates easier storage and makes filling orders fast and easy. Once your crate or container is packaged, we have it shipped with one of our nationwide, domestic carriers. We’ve negotiated lower rates with our shipping companies in order to provide you with more attractive merchandise prices. You’ll receive the same great level of service throughout the process, but you’ll find that our prices are far lower than most retailers and even other wholesalers. We train all of our staff members to pay close attention to detail. It starts in the field when the stones are surveyed, quarried and then manufactured. As they move from one process to the next, our dedicated staff members are checking for weaknesses or problems. Our goal is to provide you with high-quality granite, and we know that the quality control must be the first step in the process. When stones are packaged for shipping, we’re working toward two goals. First, we want to maximize the use of space in order to fit more stones in a crate and minimize internal movement. Second, we want to ensure that everything is properly set in position and protected in order to minimize breakage. The same processes are used at our manufacturing centers and in our warehouse. Reducing the number of damaged tiles helps you save time and money on your job site. Your time is valuable, and we respect that. We know that you need orders to be filled correctly the first time. Our customer service representatives carefully review orders to ensure that you receive the right merchandise. We’ll confirm the information, and double-check the order for mistakes before shipping. If you do find an error, we’ll work hard to correct it quickly and to your satisfaction. Our distribution center is located in Miami, but we offer shipping throughout the country. We supply businesses, retailers and contractors from the sunny shores of California to the coast of Maine. We’re happy to help our neighbors in the Miami area and along the coast, and we also send regular shipments to Texas and the greater Southwest region. With our quick responses, consistent inventory and excellent relationship with national shippers, we’re able to provide you with faster delivery. Other wholesalers take your order and ask you to wait a month or longer for the natural stone thresholds, but we take pride in getting you the materials you need as quickly as possible. 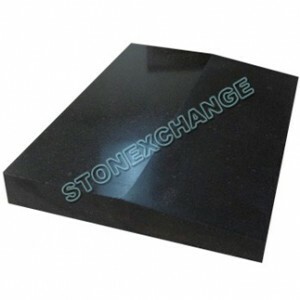 Here at StonExchange, customer satisfaction is our number one priority. We’re pleased to provide our customers with wholesale pricing and the best service. Our friendly staff is looking forward to helping you, so contact us today to see about ordering your black marble thresholds.